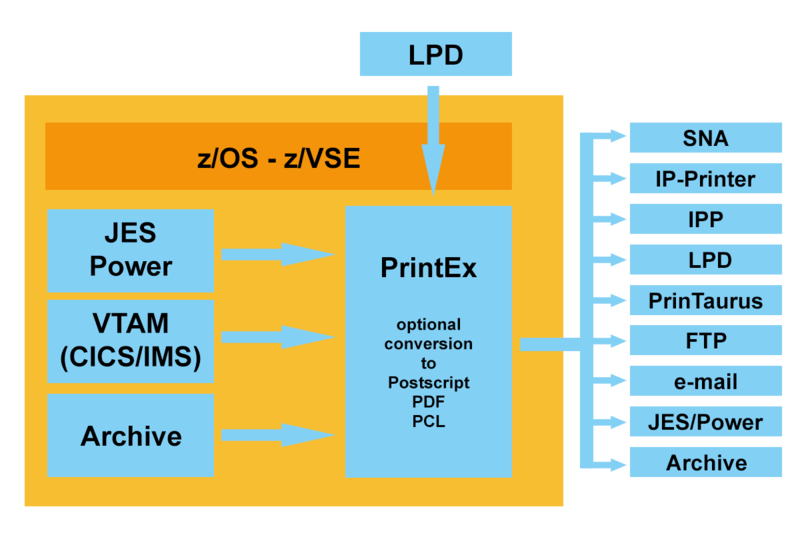 PrintEx from XPS is an application system expanding the printing possibilities on IBM mainframes which can be shortly summarized as a common host based printer driver. PrintEx is able to communicate over SNA as well as over TCP/IP. The program is implemented in IBM/390 assembler resulting in an excellent performance and resource exploitation. The administration of the PrintEx application system is carried out online by authorized administrators or via the PrintEx batch processor. In combination with the product 'PrinTaurus' from AKI GmbH, PrintEx can be administered using the PrinTaurus GUI. The basic PrintEx concept can be seen in the following image. It's apparent that PrintEx is capable of handling various input as well as output channels. This makes PrintEx a connector application being able to coordinate and distribute the various print jobs accumulated on an IBM mainframe. In order to realize the various demands PrintEx relies on an own hierarchical spool system implemented as a HFS file system based on VSAM RRDS. PrintEx uses this internal spool as temporary storage for print data. Additionally, the spool can be used as backup medium to archive print data enabling further processing at a later date. PrintEx is able to process print data generated by VTAM applications such as CICS or IMS, print data stored in JES/POWER or in the internal PrintEx spool. Potential output channels are JES/POWER or the internal PrintEx spool respectively, native SNA printers, TCP/IP printers and other mass data storages such as archiving systems or document management systems. Furthermore, print output can be distributed as PDF attachment via e-mail. All supported input- and output channels can be combined arbitrarily. Possible applications are, amongst others, the transfer of IMS print output to JES, archiving POWER lists in the PrintEx spool, direct printing from CICS to TCP/IP network printers or distributing AFP documents stored in JES/POWER as PDF attachments via e-mail. PrintEx enables the administrator to perform printer specific customizations of the print data. Therefore, it's possible in the context of the definition of PrintEx printer models to define special prefix and postfix data which will be merged into the print data stream by PrintEx. Additionally it's possible to replace defined character sequences in the print data stream. Thus, print data can be prepared for special printer hardware - without programming - through the inclusion of hardware dependent PCL or Postscript commands. This makes it easy e. g. to choose the output tray, the orientation of the print page or to activate duplex printing. The possibility to integrate PrintEx with HostDrive, an enterprise data bus from XPS, offers a great potential for fully automated further processing and distribution of mainframe print documents. E. g. these can be stored on network drives or on IBM iSeries machines, or can be exchanged with a SAP installation via Java Messaging Services (JMS).